The muley buck was staring directly at me. His tall, dark antlers stood out against the backdrop of sage grass and showcased four nearly-symmetrical tines on each side. He turned his head and revealed a small droptine falling from his right antler. The crosshairs of my scope wavered over his vitals, and my finger lightly touched the trigger. One gentle squeeze would transform him from present to past. “Take him when you’re ready,” Clint, my guide, whispered. It was November, prime time to be chasing muley bucks over the rolling plains and through the dense forests of Colorado. A musky scent hung in the air as big-bodied bucks ignored all of their innate instincts for self-preservation to focus on breeding. The rut was in full force, leaving no shortage of tall-tined antler sightings. Clint’s confusion was obvious and understandable. Weren’t we trying to kill a big buck? Yes, we were. But we had spotted this brute from the road. No hiking had been required, and the stalk consisted of a 40-yard crawl. As my rifle hung over his vitals, it crossed my mind that this buck deserved more respect than that. This wasn’t the first time I had passed on a respectable animal during a guided hunt—and probably won’t be my last. A black bruin roaming a dirt road in British Columbia would walk away unscathed; a trophy free-range axis deer made his way silently into thick cover, never to be seen again; a Wyoming antelope followed his does into the glare of a setting sun. And over the next week in Colorado, two more mule deer bucks would live to see another day. My pickiness in the field has nothing to do with antler size or body mass. In fact, it is the complete opposite. All the beasts I’ve mentioned had one thing in common: I didn’t put forth enough effort and I would have to live with that knowledge long after the hunt was over. Great opportunities can come from hunting with outfitters. It gives those of us passionate about the game we pursue better odds to walk away with a freezer full of meat and a trophy to hang on the wall. Access to private land and expert individuals who are familiar with the terrain is an advantage in the sport. But their main concern is to help you get an animal on the ground. A trek West to experience these thrills may be a once-in-a-lifetime opportunity. Don’t waste it. Make it your hunt, one that will leave you with memories to tell around the campfire for years to come. Here are a few ways to turn your dream hunt into a great adventure. Trucks and utility vehicles are useful tools. When you have hundreds of acres to cover, they make getting from point A to point B easier and give you a greater opportunity of seeing more game. But they also eliminate a large part of the hunt experience. On multiple occasions, instead of intently scanning for game, I was lolled to slumber by the hum of the engine. In one instance, after three hours of driving switchback roads through the mountains of British Columbia with my guide Gary, my eyes had glazed over and I stared absent-mindedly out the window. When we finally spotted a mature boar shuffling down the middle of the road, I respectfully passed. Half-asleep with no miles logged was not how I wanted my once-in-a-lifetime British Columbia hunt to end. I wanted to feel the burn in my legs, sweat down my back, and straps of a pack filled with meat and hide cutting into my shoulders. Instead, I politely asked to spot and stalk. Gary’s eyes lit up. He was more than happy to oblige. He was an avid sheep hunter, and spot-and-stalk hunting was his preference. He just didn’t know it was mine as well. For the next three days we drove to different locations, leaving the truck behind and trudging into the forest, hiking multiple miles a day, experiencing the rough terrain of British Columbia. A simple request allowed me to crawl within 30 yards of a sow, watch cubs climb trees in the backcountry, and take aim at a big boar that had stormed out of the woods in response to our animal distress call. Let your guides know how you prefer to hunt. If you’re a spot-and-stalk hunter, speak up. If you prefer a blind, let them know. Outfitters want most of all to ensure you experience the hunt of a lifetime—but they can’t read your mind. Three of us knelt atop a sandy, cactus-strewn hill, glassing the expansive Wyoming landscape for specs of white, hoping to spot wary antelope from afar. “Isn’t that a lone buck lying in the middle of that field?” my friend and hunting partner Natalie asked. Willie, our guide, and I turned to look in the direction she had indicated. Sure enough, the black horns of the goat were undeniable. The cold October wind stung our faces as we huddled to discuss a game plan. Together, we threw out ideas on how best to make our way undetected to the buck. Working as a team, our hunt ended in a four-mile stalk, 200-yard belly crawl, a buck in my freezer, and a sense of fulfillment that I had helped call the shots on my hunt. There were times when being guided that I felt detached from the hunt, as if I were following behind someone else who was hunting and I was there just to pull the trigger. My guides weren’t sharing their tactics and had not asked what I would do in certain situations. Being included in all aspects of the hunt makes the chase more memorable. Don’t play follow the leader and keep your head down. Your guides are there to “guide” you, but that doesn’t mean you can’t be involved in the game plan. Ask them to explain their maneuvers and why they are doing things in certain ways. Share your opinions on the best route for a stealthy approach or ask to blow a bugle or yelp softly to a turkey. Work as partners, and when you get an animal on the ground, it will be that much more rewarding. The mule deer buck caught me by surprise. His head took up the entire view of my binos. “Don’t move,” I said to my friend Ashley. “There’s a buck right here.” I was in Nebraska, helping her find her first buck. It had been slow in our makeshift blind—the bed of an old, rusted farm truck. I wanted her to experience an exciting hunt, so I had opted to move around for a bit. As we stalked through a secluded pasture, we found ourselves distracted by a curious Border collie who decided to say hello. After a few minutes of petting, he scampered away. I went back to glassing and discovered the buck had snuck in on us undetected. “Look slowly to your right,” I whispered. When Ashley didn’t reply, I moved my eyes from the binos to look at her. She was frantically searching to her left. “Your other right,” I whispered, trying hard not to laugh. 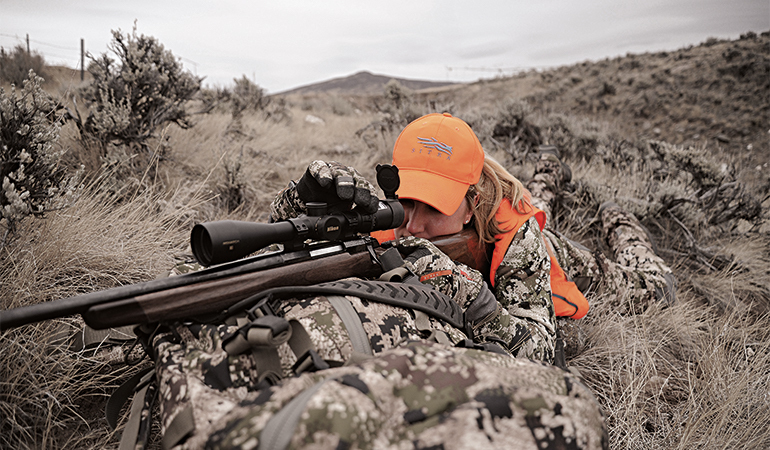 She spotted the buck, and her breathing quickened. He stood no more than 40 yards away, looking directly at us. He was no 170-inch mule deer. But he made Ashley’s heart race, and that’s all that mattered. The Border collie I thought had spoiled our hunt was actually its savior. The buck turned from us to watch the dog trot down the road. It was enough time for me to get Ashley settled on shooting sticks. After she took the shot, the buck ran 10 yards before toppling over. Our whoops of excitement could have been heard in the next county. For Ashley’s first big-game animal, the size of the buck wasn’t as important as the experience, the effort, and the camaraderie. The same can apply to your hunt. If size isn’t everything, let your guide know. 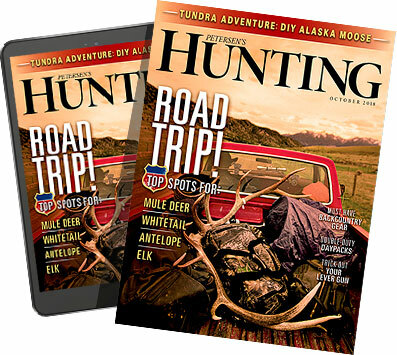 If a 120-inch, eight-point whitetail walks out of the woods and gets your heart pumping, let loose an arrow. It’s your hunt, and any animal is a trophy if you work hard for it. The musty stench of rutting deer hit my nostrils before I found him—his body lay camouflaged among the sage brush. Kneeling, I grasped the thick antlers and admired the old muley’s rack. Deep forks adorned his right beam, while his front left fork resembled a crab claw. He wasn’t symmetrical, but that didn’t matter. After passing on the first mule deer, much to Clint’s disdain, the rest of our hunt together had been filled with miles of Colorado terrain hiked, two blown stalks, one surge of adrenaline while waiting on a big buck to walk out of a coulee for a broadside shot (he never did), and this belly crawl to within 120 yards of—now—my buck. He was hard-earned, and that was all that mattered to me. We all hunger for adventure in the backcountry. Chasing bugling elk among the aspens in the San Juan NationalForest, glassing for black bears atop a rugged outcropping in the Frank Church– River of No Return Wilderness, or seeing a whitetail’s rack silhouetted against a golden sunset in the Nebraska Sandhills are experiences to be savored. Speak up, be involved, work for it. Make it yours, and you will be guaranteed the hunt of a lifetime.